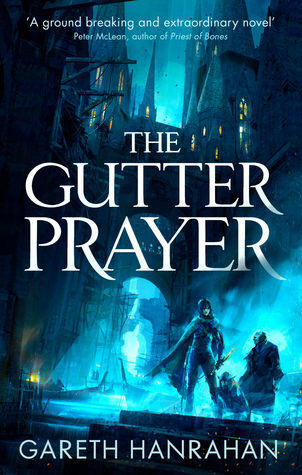 The Gutter Prayer is an epic tale of sorcerers and thieves, treachery and revenge, from a remarkable new voice in fantasy'"
The Gutter Prayer is a remarkably inventive, unpredictable book that was as incredible as I anticipated. This is a book that has such depth and intricacies to its world-building that you truly never know just what to expect from it. On a basic level, there are familiar elements int his book that can be found in many fantasy books, such as a gritty city, intrigue everywhere, nonhuman characters, etc., but that's where the similarities seem to stop. There is so much more than I ever expected in regards to the types of nonhuman characters, the gods and magic systems, and the underground politics of this world. Despite these many positive elements, there were still a few things that bothered me and prevented me from giving it a full five stars and which I will mention later in the review. Guerdon, the main city setting, is a very grimdark-inspired city that I can easily say I do not want to find myself lost in, ever. It's dark, dirty, and full of random, horrifying dangers and I was so impressed by Hanrahan's ability to create such a unique and wholly unparalleled world in a genre that already has so many different worlds out there. The Tallowmen in particular were fascinating and I would love to see some sort of illustration of what they would actually look like. There is also something called the Stone Plague that is rampant within the city that was such a unique sort of disease that I really enjoyed learning about. It's hard to talk about the magic system for me because there didn't really seem to be an overly defined one, but the magical components were extremely interesting and I loved learning about the types of gods in the book, although I would have enjoyed learning even more about them. The main band of thieves in The Gutter Prayer consist of a young woman named Cari, a ghoul named Rat, and a Stone Man known as Spar. I loved how different each character was from one another and that they all had very different backgrounds and outlooks on life. It keeps the story interesting when the three main characters--and POVs in this case--have enough things that are different about their story to keep my attention. There are quite a few supporting characters as well to explore and I think Hanrahan did a good job of building up characters to make this world feel full of life. The Gutter Prayer is a busy book. There is a lot going on all the time and a lot of different history, magical components, characters, plots, and other events going on simultaneously, which does make it a little difficult to keep up with things. I felt a little overwhelmed at times, and I found that the ending was a bit overstuffed with content. That being said and despite the abundance of constant information, Hanrahan did manage to rather eloquently and tightly bring together all of the different threads occurring in the story into a final conclusion that seemed to wrap everything up in a satisfying way. The few other areas that I had issues were mainly with the characters and a some of the plot. The characters themselves seemed like interesting people and for the most part I enjoyed following them, however, there was something off about all of them. I felt like I was being held at a distance from all three of the main protagonists, and although we get a bit more in depth into the nature of those such as Spar and Cari, there was always some sort of wall between myself and the characters. Rat in particular was a character that had so many interesting elements (you know, being a ghoul and all) and I was enamored with, and yet we didn't gt to spend nearly as much in-depth time with him as I expected. Additionally, the book is pitched as being about a crew of three young thieves and yet we rarely ever saw them all in one place working together. In fact, Rat seemed rather emotionless and uncaring towards a lot, so if the group's bond hadn't been emphasized so much in the beginning I'm not sure how much I would believe it was there. And lastly, in regards to plot, I thought it seemed slightly meandering in some places and that the ending, although I enjoyed it, was a bit confusing. I kept forgetting what the main plot goal was supposed to be while reading a lot of this book, which isn't necessarily something that should happen. As mentioned, this is a busy book with a lot going on and sometimes I felt that there was just a bit too much going on. Overall, I've still (as of now) given The Gutter Prayer 4.25 stars! The imaginative elements and entertaining aspects kept me fully engaged and I look forward to see what Hanrahan does next. Woah, I really like the sound of this. Definitely something I'll have to check out! This is the second excellent review I've read for this book this week. It sounds like such a great story.